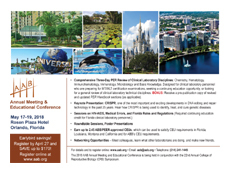 We are excited to announce that the 2018 AAB Conference and CRB Symposium will be held May 17-19 at the Rosen Plaza Hotel, Orlando, Florida. The meeting committee is planning a stellar program, including a variety of interesting and informative educational programs and networking and social events. The Orlando International Airport (MCO) is just over 13 miles from the Rosen Plaza Hotel (20 to 30-minute travel time, depending on traffic) and offers one of the largest flight selections in the country. With service to 100+ cities world-wide and an average of 745 scheduled flight operations per day, travelers should be able to find a convenient arrival/departure time. The preliminary schedule can be viewed here (PDF). Guestrooms with complimentary basic Wi-Fi Internet access, laptop safe, coffee/tea maker, and a mini-frig for cold beverages and snacks. $8.00 per day self-parking at Rosen Plaza Hotel for AAB/CRB hotel guests who are driving in or renting a car. A variety of food and beverage options, including Café Matisse, Jack’s Place, The Lobby Bar, ’39 Poolside Bar & Grill, Smooth Java & Gift Shop (serves Starbucks® coffee), and Lite Bite Express 24-hour Deli/Shop. Swimming pool and whirlpool spa. State-of the art fitness center with Life Fitness equipment and free weights. Attraction ticket sales and transportation arrangements. And, the Rosen Plaza is surrounded by Orlando’s world-famous attractions – SeaWorld Orlando®, Universal Orlando Resort™, and Walt Disney World Resort®. Hotel Reservations: The AAB/CRB group room rate is $163 per night, single or double occupancy, plus applicable surcharge and tax (currently a 1% taxable Orange County surcharge and 12.5% sales tax). While the deadline for guaranteed availability of hotel rooms has passed, rooms may still be available. The Rosen Plaza Hotel will continue to honor the group rate as long as rooms are available. To make reservations call (800)627-8258. Contact Shannon Soos at the AAB office if you have any problems reserving a room: (314)241-1445. So what's new in Orlando? 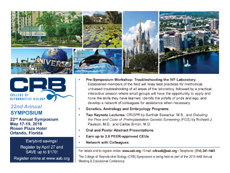 In this workshop participants will hear from several established members of our field as they relay best practices for methodical, unbiased troubleshooting of all areas of the laboratory. This will be followed by a practical, interactive session where small groups will have the opportunity to apply and hone the skills they have learned, identify the pitfalls of pride and ego, and develop a network of colleagues for assistance when necessary. Download a printable registration here. Student Registration can be downloaded here.